iSoccerPrediction was created to bring good and accurate tips and predictions to the world of soccer punting. Our crew studied football teams thoroughly throughout the seasons after seasons. With our extensive connections with the underground sportsbook and syndicates after being industry for so many years, we are confident that our tips will be at the best quality. iSoccerPrediction.com provides expert soccer betting tips and picks in Asian Handicap, Fixed Odds 1x2 and Total Goals bets for major European leagues to the minor leagues. Our aim is to score consistent profit on every match day. Soccer betting must be looked at as an investment like stock market, there will be days where things wont go your way, but if you know how to prevail them, we can guarantee you that you will be seeing consistent profit with a healthy bankroll. iSoccerPrediction.com tipping odds are obtained directly from SBOBET.com, the World’s Leading Online Asian Handicap Sportsbook. All Odds may varies and they tend to fluctuate according to the market betting pattern and of course other market forces, so please check with your respective sportsbook for the latest odds before making your final decision. Notice: All date/times subject to GMT +0800 (Hong Kong time). 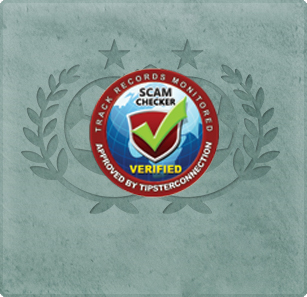 isoccerprediction.com is a verified tipster by indepedent company tipsterconnection.